I used to have a serious yarn buying habit. It was wonderfully therapeutic, and I had a head full of lovely ideas, but I had to accept that I live in a world with limited knitting time, not to mention limited money for such things. Two years ago, when I was unemployed, I sold some particularly desirable skeins on Ebay. Last year, when I was working again, I went on a yarn diet. I knitted from stash and not one single solitary gramme of new yarn came into the house. But I still have a fair bit of yarn, and I have decided that this year I am going to knit up the oddments. The balls left over from projects, the skeins I wound but didn’t quite get around knitting, and some yarn that I bought for specific small projects. I went through my knitting baskets at the weekend, I bagged up the yarn in question, and I began to plan. The yarn recovered from a hat that was too big. Two strands of two similar but different shades of Cherry Hill Supersock Merino would together. They used to be a shawl, but I didn’t like the shape. A few balls of Debbie Bliss Soho. I bought a pack because I loved the colour, but I realised that the colour was unwearable, the thick and thin single play was less than ideal for knitting. I’ve made a So Called Scarf from some of it and I have to work out what to do with the rest. Jumper leftovers that will make another hat. The yarn that my mother starter to make a bolero with. She didn’t get on with the pattern, so now I’m thinking that there’s enough to make a little top for her. A skein I wound for an Everglade hat and a ball that I don’t remember buying that I think will be well suited to socks. Two skeins that I remember winding for a striped shawl, but might become something else, because I’m not really a lightweight shawl person. I’ve knitted a hat and mittens from this yarn, and what’s left is destined to become a scarf. Probably this one …..
Gorgeous Fyberspates Scrumptious DK, enough to make a shawl or a cowl. More jumper leftovers that I think will be enough to make yet another hat. A few balls of Lang Yarns Mille Colori, that I bought with an entrelac scarf in mind. I’m not going to say twelve bags in twelve months, because I’d like to make a garment or two, but I have learned that small projects work best for nursing home knitting. They’re portable, and I can show off results and ring the changes before boredom sets in. So I’ll say I’d like at least six bags to be gone by the end of the year. That’s manageable. And I must enters projects on Ravelry – I’m horribly behind …..
Ah, but you haven’t seen the storage box or the rest of the house. I’ve not had much success with Ravelry trades – I’ve requested a couple and had no response, maybe because there are a lot fewer of us in the UK. In the past three months I’ve knitted well over three dozen pairs of hand-warmers – my own design so it’s very simple – and about a dozen snoods. I’ve also made a selection of hats – some to match the snoods or the hand-warmers. Some, but not all, had button decorations added. When I got bored with the knitting I turned to crochet and made a few dozen ear-warmers/headbands and kept them plain or again decorated with buttons and/or crocheted flowers. All of these used either small amounts of yarn or two yarns wound together. I made four sets of cowls/neck-warmers using Aran wool mixed with Stylecraft Pom Pom and these looked very effective and were extremely warm to wear. Just trying to let you know that you can have a tremendous amount of fun making items to sell, give as gifts or donate to charity or to keep for your own use and get through a pile of wool at the same time. Now, if only I could resist the temptation to buy more . . . . my stash pile would decrease!!!! ps Do you know how to do Russian joins? A marvellous way of using up oddments of wool because you can join one colour to another and continue to knit/crochet without having any ends to sew in and the end result is pleasingly random. My goodness, you are an efficient knitter. I should always have a small project on hand now I know just what I’ve got, and anything we don’t want to keep will be passed on as a gift. Very cool. I don’t knit and don’t want to learn because I already have too many crafts I seem to have abandoned… Best to you on your goals! I would love a new scarf if you ever run out of anyone to knit for – ha! I’ll bake you a pie. I learned young, so the knitting habit is engrained, but it’s my only craft. I can’t crochet and my only sewing is putting on buttons and making minor repairs. As a new knitter, this post is very exciting to me! 🙂 I can’t wait till I’ve assembled a yarn collection and enough skills to make many different items. I hope you’ll share some of your work with us this year. There are so many possibilities out there, and once you’ve mastered the basics so much else is just applying those things in a different way. It’s lovely to have an odd ball or two to make something small, but things have got a little out of hand and I need to bring them back under control. Yarn is so tempting, but I’m trying to teach myself only to buy when I have a definite project. It’s far to east to accumulate more lovely yarn then you can ever knit. I can do very basic knitting so anyone that can do anything more than that – good luck with your projects! I learned young and kept the habit, but I need to keep things in proportion, because I’ve never found a way to read and knot at the same time! I’m trying to do the same thing before I move! I’m trying to make a blanket out of all my remaining yarn, so hopefully I can start fresh in the new place. Good luck! I wish I could knit – I am a crocheter. Maybe this is the year! An excellent plan! I can knit but I can’t get the hang of crochet at all. maybe one day! 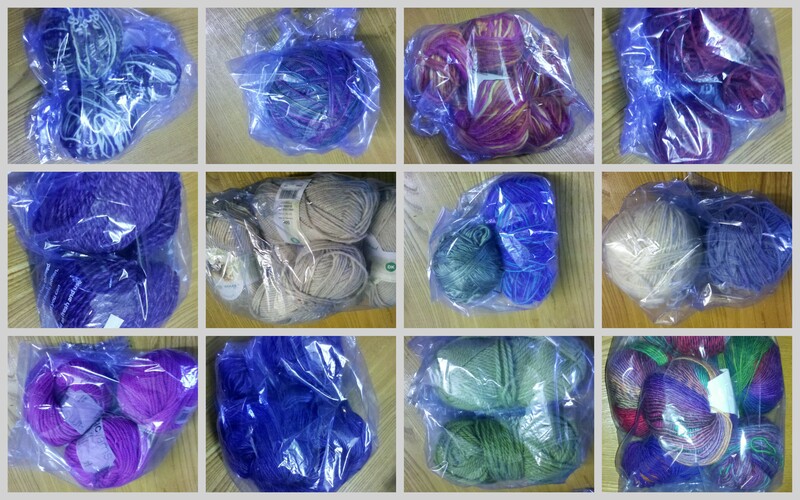 I recently went on a yarn-buying-binge after doing so well in an attempt to use up my stash. My excuse was that I have four important new babies to knit for this year, and that needs special yarn, doesn’t it? Of course, I didn’t limit myself to the baby projects, so now I’m back to having way more yarn than I can feasibly knit. It’s just all so lovely. Sigh.